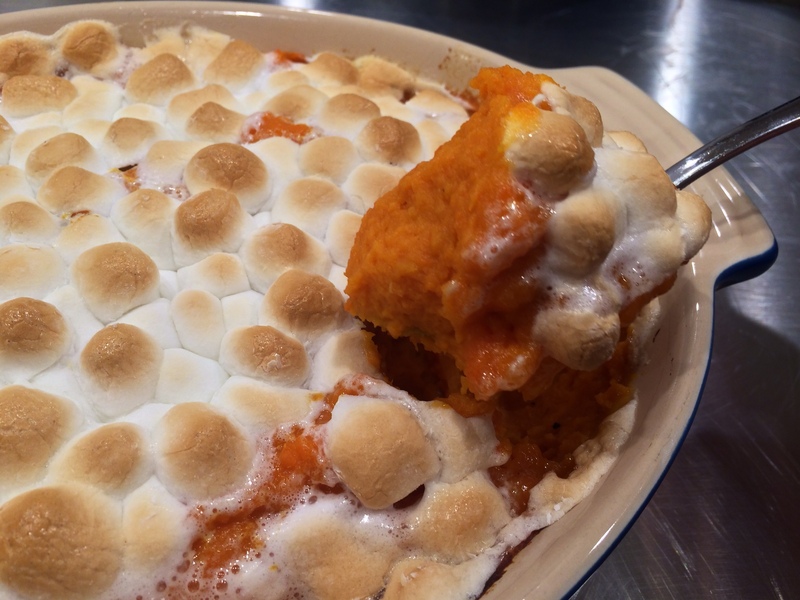 When thinking about Thanksgiving side dishes to make ahead, we knew we wanted something with sweet potatoes but thought, “how can we change it up?” We didn’t want the normal sweet potato casserole you see EVERYWHERE – even though we love it. So when we found this one with fresh carrots and a little lemon zest, we knew we found a winner! An added bonus? It’s very diet-friendly! 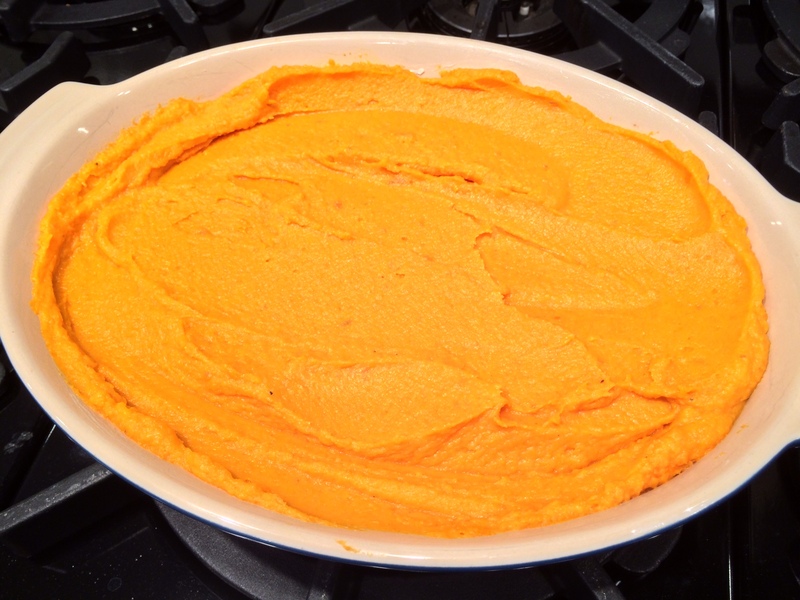 Bake sweet potatoes on an aluminum foil-lined 15- x 10-inch jelly-roll pan 1 hour or until tender. While still warm, gently mash the potatoes before adding them to the food processor. This can easily be done with a fork. 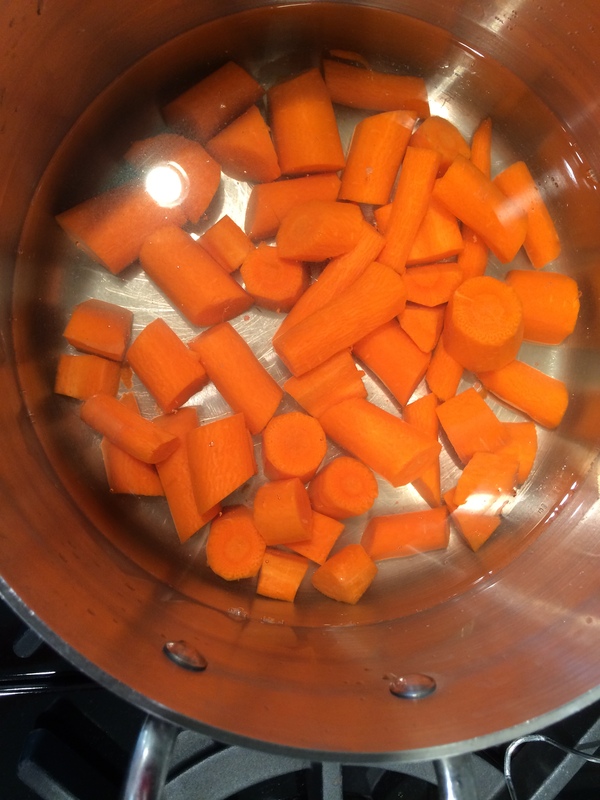 Boil the carrots until very soft – approximatley 25 minutes. Then drain. 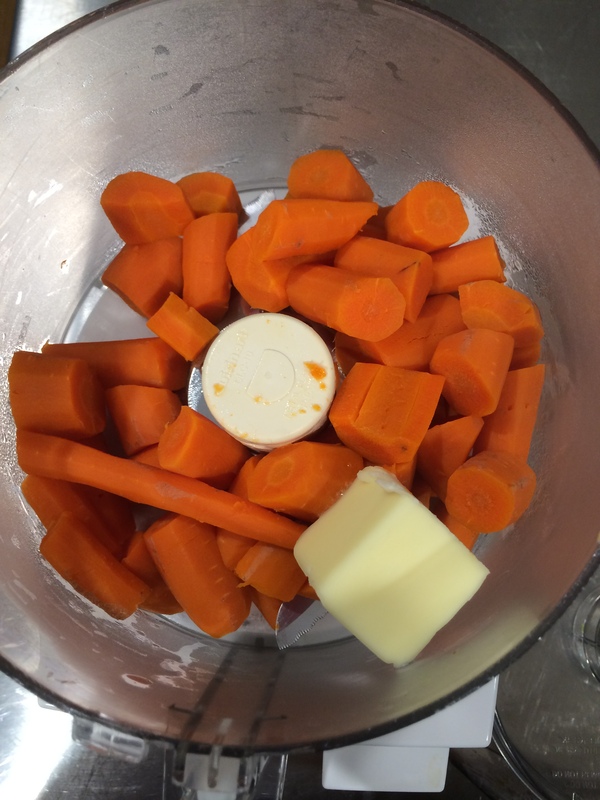 Add the cooked carrots and butter to the food processor. Process until very smooth and transfer to a large mixing bowl. 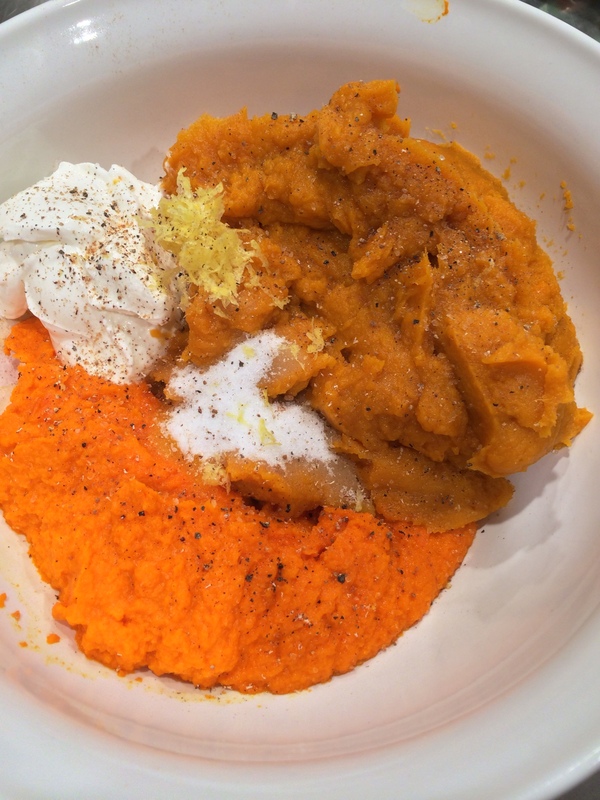 Add the sweet potatoes to the food processor. 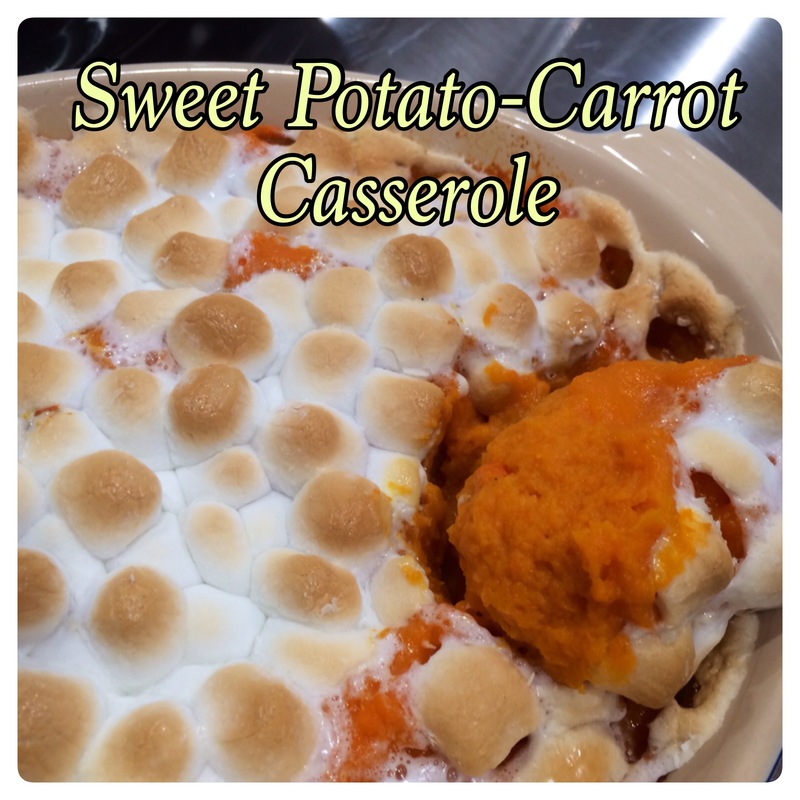 We did these in several batches and added each batch to the bowl with the carrots. The above picture is PRE pureed. 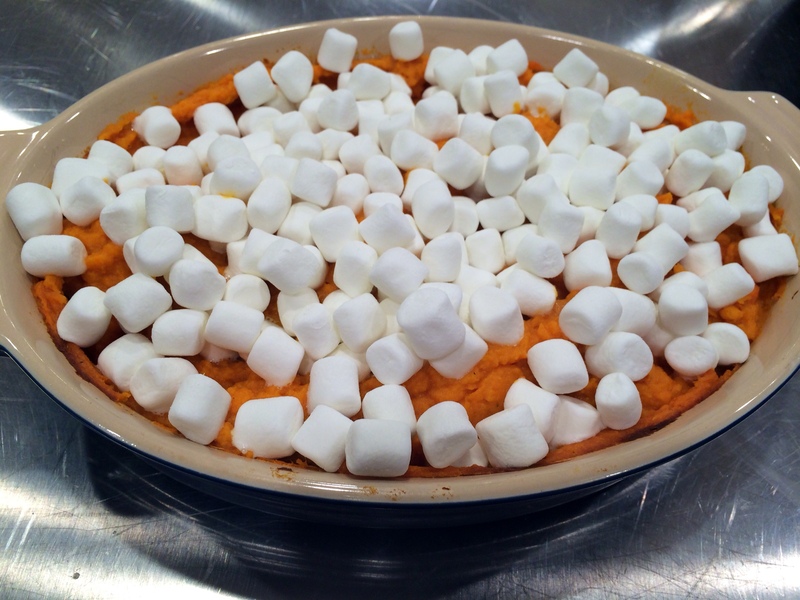 After pureeing the carrots and sweet potatoes and adding them to a bowl, add the remaining ingredients up to the marshmallows. 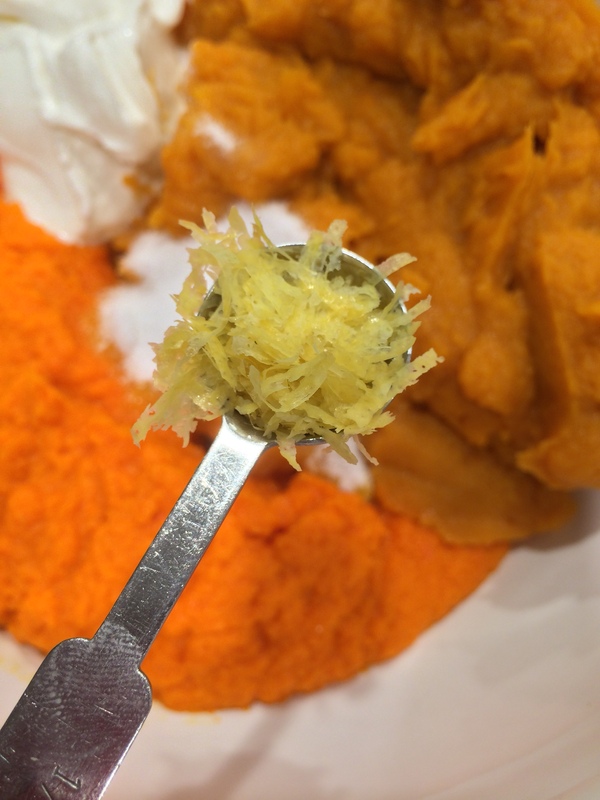 The lemon zest we added is the perfect addition to the recipe. Stir the ingredients until blended. Mix it really good to combine the flavors and sour cream. Spoon mixture into a lightly buttered casserole dish. At this point, the dish can be covered until it’s time to cook. Remove from fridge about an hour prior to cooking. When it is time to cook, bake at 350° for 30 minutes or until thoroughly heated. After heated through, remove from oven. Sprinkle with marshmallows. Bake 10 more minutes or until marshmallows are golden brown. Cooked carrots add smooth texture and extra flavor to this comfort food favorite. Preheat oven to 400°. Bake sweet potatoes on an aluminum foil-lined cookie sheet for 1 hour or until tender. If cooking casserole immediatley following preparation, reduce oven temperature to 350°. Cool potatoes 30 minutes. Meanwhile, cook carrots in boiling water to cover 20 to 25 minutes or until very tender; drain. 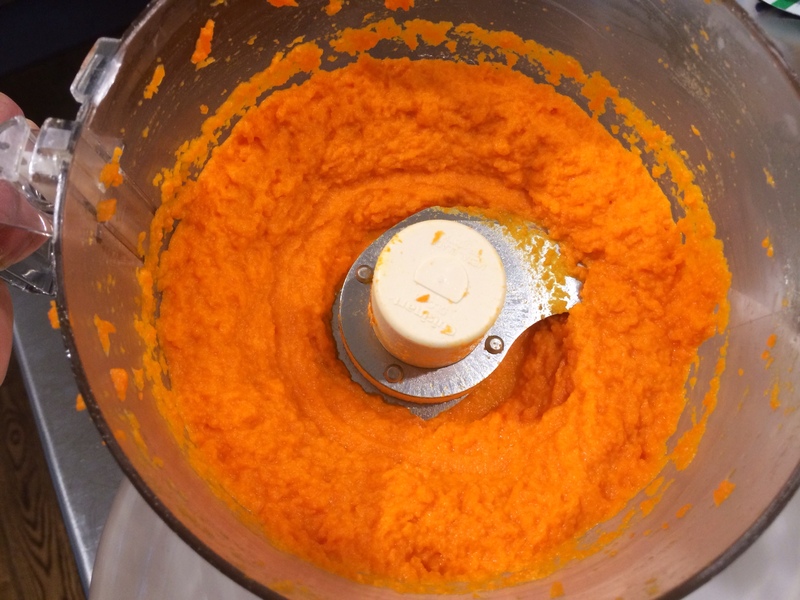 Process carrots and butter in a food processor until smooth, stopping to scrape down sides as needed. Transfer carrot mixture to a large bowl. 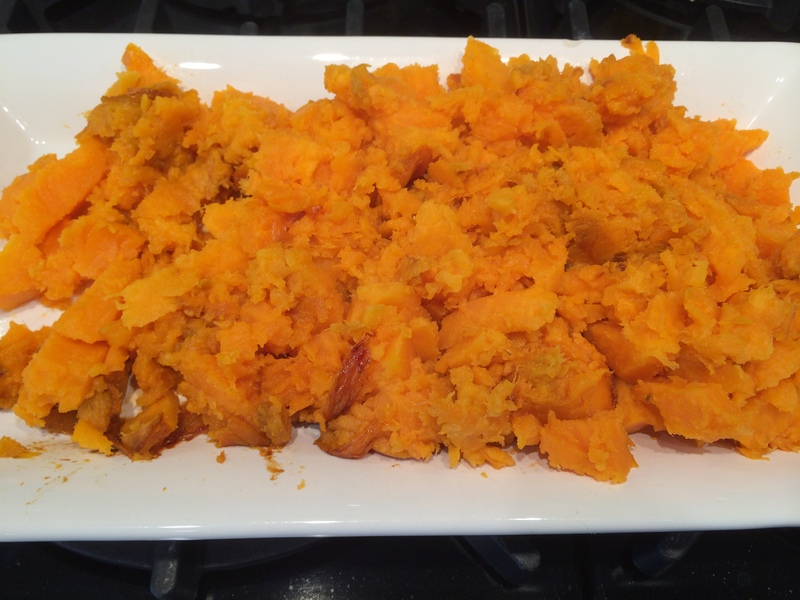 Peel and lightly mash sweet potatoes. Process, in batches, in food processor until smooth, stopping to scrape down sides as needed. 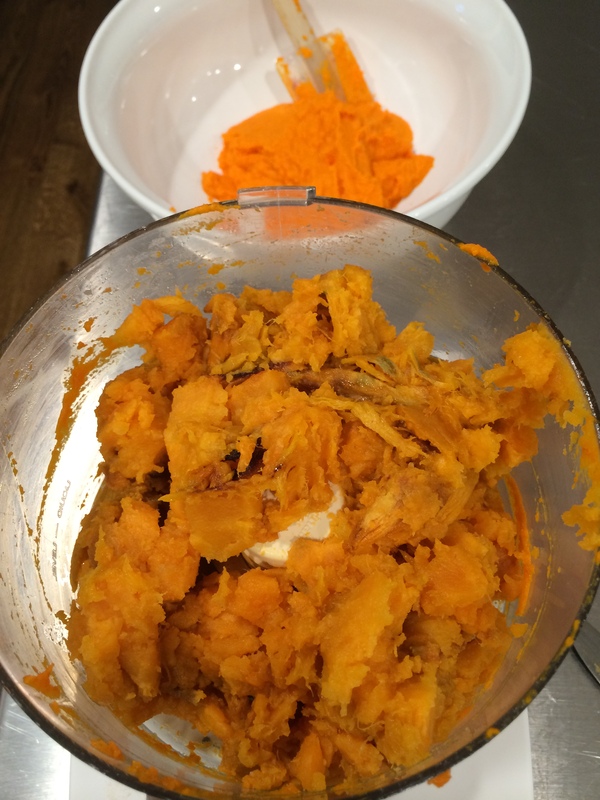 Add sweet potatoes to carrot mixture. Stir in sour cream and next 5 ingredients, stirring until blended. Spoon mixture into a lightly greased (buttered) 13- x 9-inch baking dish. Bake at 350° for 30 minutes or until thoroughly heated. Remove from oven. Sprinkle with marshmallows. Bake 10 more minutes or until marshmallows are golden brown. Note: To make ahead, prepare recipe as directed through Step 4; cover and chill up to 24 hours. Remove from refrigerator, and let stand 30 minutes. Proceed with recipe as directed in Step 5. We made this for 4-6 side dish servings. Double the recipe for a larger crowd.